Liven up the seas and oceans of Minecraft. 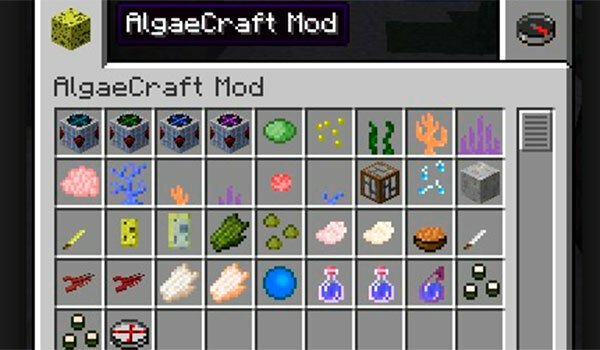 AlgaeCraft 1.7.10 is a mod that handles of adding various elements in the natural generation of the world, such as algae, coral reefs or sponges. The sea sponges will enable you to achieve normal Minecraft sponge, that, as you know, it is not available in survival mode. In addition, find lobsters under the sea, to capture and cook them. Now the squid may serve as food and also you will be able to make sushi. The mod adds several filters that allow you to plant various aquatic plants outside their habitat or biome to cultivate at any other place. How to install AlgaeCraft Mod for Minecraft 1.7.10? New options and possibilities for the seas and oceans of Minecraft!